This week has been pretty uneventful. Cessna and Aiden (16 weeks) went to the vet to get their vaccinations. Cessna got a clean bill of health and happily only had to get one needle and then some blood drawn for her heartworm test…what a brave little girl! Aiden got his final set of puppy vaccinations and also got a clean bill of health, he now weighs 35lbs! After a week of not feeling so hot, his belly is now back to normal, it’s amazing what a few days of just rice and Pepto will do. 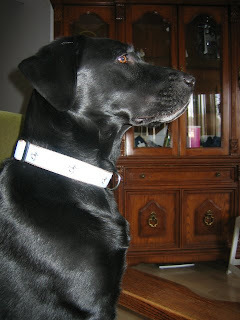 After going to the vet we headed off to visit a friend who also has a dog guide. 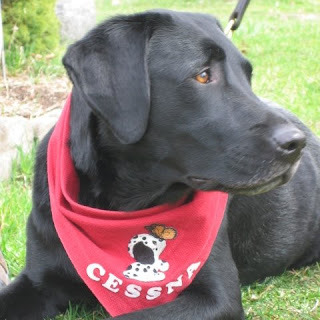 Boise is a 4 year old black lab from GDB, a VERY big boy! Cessna and Aiden wasn’t sure what to think of Boise, he had surgery on his eye about two weeks ago and is still needing to wear his cone to protect him from scratching at it. Just imagine what it would be like to see a great dane wearing a cone on it’s head…that’s how big he is and how strange it looked. After a nice visit with my friend and Boise we headed off to dinner with another friend at Frankie Tomatoes…yummy all you can eat Italian! Cessna and Aiden did very well, just lying under the table and watching the other patrons walk by with their plates full of food. The rest of our week has been spent working on plans for our local Purina Walk for Dog Guides and spending lots of time outside. Aiden was born in December so has never experienced the heat of an Ontario summer, did he ever get a quick lesson. We took everyone to the local school yard to play fetch each day this week so they are really beginning to enjoy the nicer weather. Aspen and Aiden are finding it a bit hard to get used to right now, but I think soon enough Aiden will adjust like Phoenix has who is also a yellow lab. Aspen on the other hand hates the summer months, being a golden she likes it as cold as possible. When Cessna and Phoenix are lifting their paws in the winter, Aspen is laying in the snow eating ice and loving it. Cessna finds it tough when it is really sunny out because her black coat just seems to draw in the heat, but she still loves her free runs no matter what the temperature. On Wednesday Aiden (15 weeks) and Cessna accompanied us on a trip to London where we attended Fanshawe College’s social gathering. It was a gathering of aboriginal students from the college and surrounding high schools, as well as some of the aboriginal community members. We missed the cultural teaching workshop in the morning, but were able to partake in the afternoon festivities. The afternoon was filled with traditional aboriginal dancing, with some people even wearing their regalia’s. Cessna has been to several aboriginal gatherings so the noise of the drums and singing was no surprise to her, she just laid in front of me and slept. 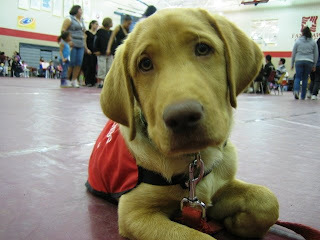 Aiden was quite curious at first, wanting to check out what was going on in the centre of the gym. After a bit though he just settled down for a nap…nothing seems to phase this little guy! There were people dressed in all sorts of regalia’s, every First Nations group has their own style and every type of regalia has a meaning. Jingle Dress dancers are easy to spot because of the tin pieces in the shape of cones sewn carefully to their dress, as well as the jingling noise they make when dancing. 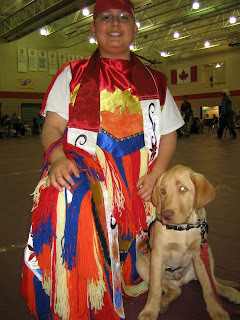 The jingle dress itself is a unique work of art. The dress, usually made of traditional buckskin is sewn in a straight fashion from sleeves to hem. Tradition states that the small metal cones, or the “Jingles” attached to the dress represent several different things. The sounds of the jingles ward off bad spirits and welcome good spirit into the dance. The Grass dancers’ outfits of today consist of a belt, cuffs, headband and harness with a porcupine roach which adorns two eagle feathers or a set of plumes. The dancer moves his hips, arms, head and shoulders in harmony with the movement of his legs and dance steps. Dancers attempt to imitate nature, resembling the gentle swaying of grass on a windy day. Traditionally, the grass dancers were called out to the place where feasts and special events were to take place. The dancers blessed the ground while they danced in time with the beat of the drum. While the grass dancers danced, they flattened the grass with their feet in preparation for the ceremonies to take place. The Women’s Fancy Shawl dance symbolizes the life of a butterfly. . Women’s Fancy Shawl dancers have beautifully intricate outfits. The dancer will wear a cape which is usually fully beaded. Also, they have matching leggings and moccasins, hairpieces and jewelry. Distinctive to the women’s Fancy Shawl dance is the way in which they use their shawl as adornment, delicately draping it over their bodies. It is in the movement of her body while she dances and the lightness of her dance steps that makes the butterfly come to life. dancers wear porcupine head roaches, fur- leggings and bells. There are Northern and Southern ways of dancing Women’s Traditional. Northern style is danced by remaining in one spot, lightly bouncing in rhythm with the drum. Southern style has the women slowly and gracefully walking around the Circle in time with the drum, gently stepping toe-heel, toe-heel with the feet appearing to “walk on clouds”. Both styles carry a fringed shawl folded over their bent left arm, a purse in their left hand, and a feather fan, usually eagle or hawk, in their right hand. The women hold themselves tall and proud, their bodies straight. The fringe on the shawl is to sway naturally with the movements of the women’s feet, not from upper body bending or swinging. The fan is raised in salute when the women hear the drum giving honor beats. At all times, the dancers are to stay in time with the drum and stop precisely when the drumming ends. The ladies wear knee-length beaded moccasins, leggings, and either a bucksin or cloth dress that has long, open sleeves. There are two styles of buckskin dress; once again, Northern and Southern. The Northern style is to completely bead the shoulder or cape part of the dress, whereas, the Southern style uses beadwork mainly as an accent. Also in bucksin regalia, the moccasins are either fully beaded (Northern) or accent-beaded (Southern). Men’s Traditional dancers were an eagle feather bustle as part of their outfit. This dancer’s regalia is quite beautiful with colourful beadwork and a roach as a headpiece. Through his dance moves and steps the dancer tells a story of heroic battles or successful hunting trips. 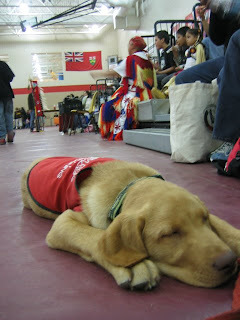 Attending aboriginal gatherings such as Pow Wows is one of the highlights of my summer. I grew up knowing very little about my mother’s heritage, but as I grew older and was able to read about everything, I began to involve myself in my Ojibwe culture. 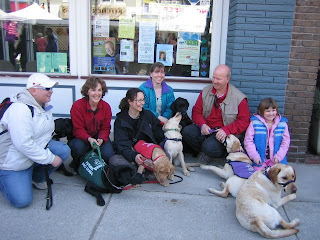 Yesterday Cessna, Aiden and I accompanied a few other foster moms and their puppies to the Elmira Maple Syrup Festival. I’ve never seen so many people in a small area (or what seemed like a small area) before! We had to weave our ways in and out of the crowds that filled the walkways and sidewalks. There were tons of vendors with food and merchandise. Cessna did an amazing guiding job, not walking me into one thing or one person the whole entire day…way to go baby girl! Too bad you weren’t a little taller though because then we might not have gotten momentarily separated from the grou…lol! The puppies all enjoyed trying to get the various food items that had been dropped, but most were quickly removed by the fast reactions of the seasoned foster moms…thanks guys! Aiden thought it was a good idea to grab a whole napkin and eat it, but it was quickly taken out. Another time he decided to try and eat a pancake, but again it was removed successfully. Poor guy though had the runs last night, not sure what he got without all of us knowing, but he seems to be feeling better this morning…sorry monkey man for not allowing you to eat breakfast, but it’s for your own good! Did you know you can give a dog canned pumpkin when they have the runs? I didn’t, but my husband did some research on what to do with a 3 month old puppy who has the runs and learned about this interesting trick. We have opted for the fasting for 12 hours, but at least we know for another episode. 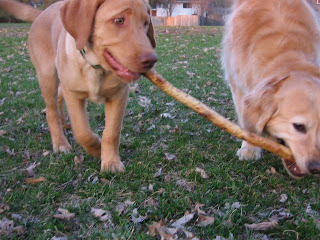 When Aspen was a puppy, about Aiden’s age, she ate a corn starch bone by nyla and threw up for hours. We ended up having to take her to the vet for an afternoon of intravenous fluids, so no more corn starch bones for any of our dogs! After that day with Aspen we worry about something similar happening, but thankfully there is the internet to look up ideas for what to do. The trip was quite exhausting for all of the puppies, including Cessna. They saw dogs of all types, people of all sorts, and even horses…Boomer, it is not necessary to bark at them, they were just giving the little kids rides you silly boy! All of us were stopped after every step we took to have people pet the puppies and ask about what they will do in the future and what our purpose was as a foster mom. I don’t think we even made it all the way through the entire place in the 4 hours we were there. Poor Cessna had to sit and watch while the puppies were all given tons of attention and treats, but she was a good sport about it. I think it must have been neat for the people walking by us to see coats of all colours and a working dog too. In our group we had: Foxy in purple (a foster for National Service Dogs), Varsity in green (a foster for Lions Foundation of Canada), Cessna in her harness, and Boomer and Aiden in their red coats (Autism Dog Services fosters). We also got a chance to meet up with 2 other NSD pups, Comet and Bo (I think), they were so well behaved. Maybe they will be able to come out on one of our future puppy adventures. After we had all tired ourselves out we started the long trek back to the wagon to be taken to our cars. 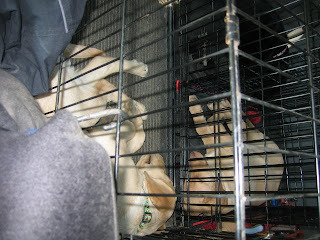 The puppies and Cessna were so exhausted that they just laid by our feet hoping no one would come near to bother them. On the car ride home Foxy and Aiden passed out and Cessna just laid in the back watching the world go by. At home Cessna and Aiden ate dinner and then crashed and never made a sound until later that night.